Came across this piece I wrote a few years back about one of my all-time favorite comic book artists and thought I'd share it here at Creation Point. Enjoy! I have warm memories of summers when I was six, seven, eight years old. After dinner I’d take a walk with my father, strolling up Foster Avenue to the local candy store—that’s what we called them in Brooklyn, anyway—where you could buy anything from a vanilla egg cream to a Pensy Pinky, a stick pretzel to a paddle ball. My father would pick up the evening paper and he’d buy me a comic book. (Which, till I was eight, cost one measly dime. That leap to twelve cents, in 1962, was shocking.). Well, I’m not sure how I knew who Gil Kane was. Credits didn’t become a regular part of the comics landscape till Stan Lee popularized them at Marvel and I didn’t discover Marvel till I was in junior high school. I assume Kane’s name was mentioned on the letters pages of the books he contributed to. Whatever the case, I not only knew who Gil Kane was, I thought he was the greatest artist to ever put pencil to paper. Super-hero comics weren’t as dominant then as they are today, but there were still plenty to be found; and, in those pre-Marvel days, my two favorites were Justice League (all the DC heroes in a single comic book? What pre-pubescent lover of fantasy-adventure could resist that? 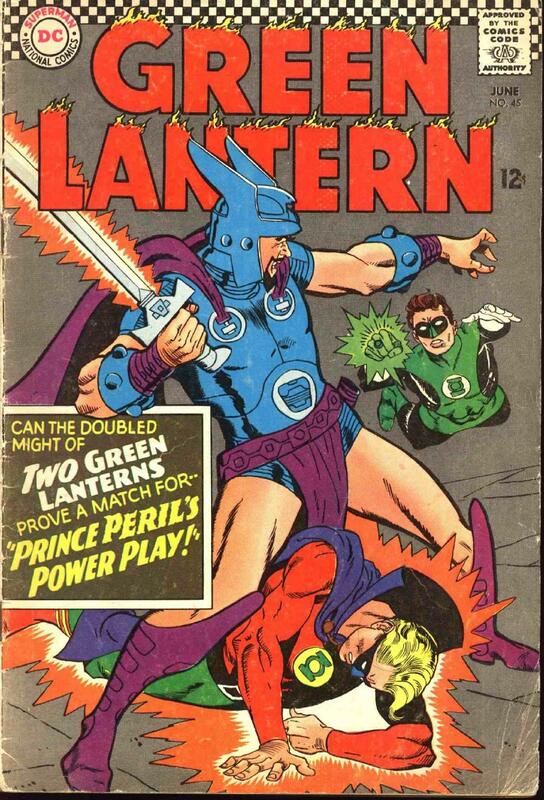 )—and Green Lantern. 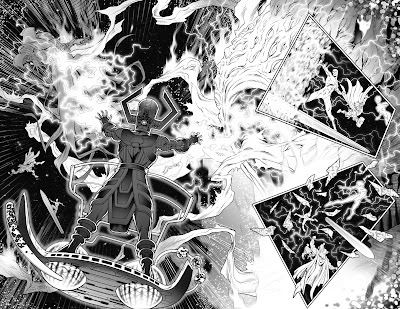 There were three reasons I adored GL: 1) the brilliant premise (magic ring + will + imagination = unlimited abilities) 2) John Broome’s universe-spanning stories and 3) Kane’s extraordinary art. Kane was the clincher. 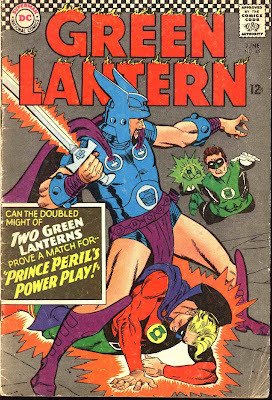 As a kid, I was almost as obsessed with drawing as I was with reading comics, and, to my young eyes, you just couldn’t beat Kane’s Green Lantern, soaring through the air, ring hand thrust toward the reader, one leg tucked back behind the knee. I spent many a happy hour with a Green Lantern cover in front of me, trying, in my clumsy way, to replicate the art, line for line. Unlike Jack Kirby—whose genius I wouldn’t discover for a few more years—Kane’s figures weren’t about bulk and mass. They were lithe and fluid. There was Kirbyesque power in those figures, sure—when Kane took on the Hulk strip in the late sixties, he gave Kirby a real run for his money–but the hallmark of Kane’s work was a grace. 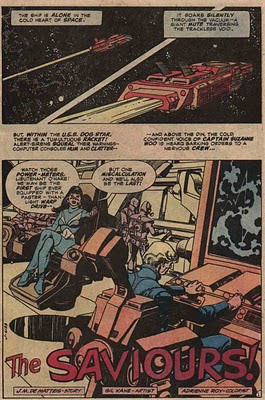 When I started my professional career at DC Comics in the late 70’s, I was lucky enough to have Kane illustrate a story I wrote for a short-lived science fiction anthology called Time Warp. The story–“The Saviors”—was nothing special, but the art? Perfection. And, hey, my name was in the credit box with Gil Kane! It didn’t get much better than that. Actually, it did—because a few years later I found myself teamed with Kane again, on my last four issues of Conan, The Barbarian. Kane had come on board to replace John Buscema who left—well, because of me. Some months into my run on the book, editor Louise Jones let me know that John had been rumbling and grumbling about Conan’s direction. (I don’t recall any specifics beyond the fact that he had absolutely no patience for Dukenrik and Jonnwalli, the two young wanderers I’d introduced into the series. John felt, very strongly, that kids had no place in a Conan story.) 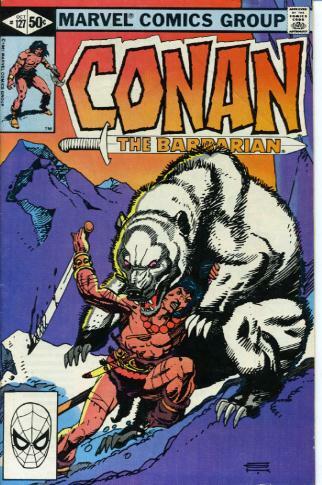 I was still relatively new to the comic book business—Conan was my first, full-length monthly assignment—and the last thing I wanted to do was displease a man whose work I profoundly respected and admired. I called John up, we had a short and, as I recall, somewhat uncomfortable talk—I was completely intimidated—during which he outlined all the elements he thought were essential to a great Conan story. I was grateful for his input and told him I’d fold all those elements into the next issue, which I did. “The Blood Red Eye of Truth” ran in Conan #126. John did his usual brilliant job with it. And then he quit the book. I wasn’t happy about it—would you want to be known as The Guy Who Drove John Buscema Off Conan?—but the truth is I couldn’t remain depressed about John’s departure for very long, because, as mentioned, Louise had lined Gil Kane up as his replacement. The first issue I wrote for Gil was called “The Snow-Haired Woman of the Wastes” and it was my attempt to do a story in the vein of Robert E. Howard's classic “The Frost Giant’s Daughter.” I’m not sure if the story holds up after all these years, but the art is another matter. From the opening sequence, as Conan struggles desperately to save the mysterious Xean from a massive white-furred bear, Kane nailed it. There was so much power and clarity, such raw emotion and excitement in the battle that I had no choice but to stand back and shut my big mouth, putting as much text on an entire page as I would have normally stuffed into a single panel. (Looking back, I think the sequence would have worked even better if I’d left the words out entirely.) The rest of the issue was just as amazing. It had been twenty years since I first discovered Gil Kane’s artwork—and the man was better than ever. I only stayed with Conan for another three issues—I finally realized that, as much as I loved the character, the kinds of stories I wanted to tell were best suited to other venues—but what an honor to have those final issues illustrated by a man whose work illuminated my childhood and brought me such joy. I don’t recall any conversations with Kane—we might have spoken briefly once at the Marvel office, but I can’t swear to it—but seeing those stories come alive on the page, in the way that only Gil Kane could, remains one of the highlights of my career in comics. Ray Bradbury has died. How is that possible? Here was a man so filled with joy, with passion, with a towering hope most of all, that it seemed he would would out-dance death and live forever. 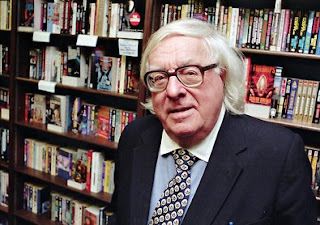 As I've made clear many times, there are few people on the face of the planet who have influenced and, more important, inspired me as much as the great Ray Bradbury. Reading a classic Bradbury short story or essay on creativity, immersing myself in his novels (especially Dandelion Wine, one of the most glorious and magical books ever written), is an experience that strips away the layers of what I call the CNN Reality—the voices of Doom and Naysaying Cynicism that seek to tell us that we're small and helpless, ordinary and afraid—and opens our hearts and minds to a deeper, truer, more joyful reality: one where life is sacred, creativity is an expression of pure delight and the universe is viewed with eyes of innocence and wonder. Bradbury's words set fire to my soul decades ago and they still do the same today. People call Bradbury a science-fiction writer, a fantasist, but I don’t think either label applies. He’s a preacher, a rhapsodist, an interfaith—no, interdimensional—minister. I’ve rarely encountered anyone who more eloquently encapsulates the sheer sacred joy of life. When I read a Bradbury story, I not only want to race to the computer and create literary wonders of my own—the greatest gift a fellow writer can give you—I want to race out the door and up the street with my arms wide, embracing the entire universe. Reading Bradbury—opening your mind and heart to that unique voice, that amazing spirit—it’s as if the author himself arrives at your house. The door bursts opens, nearly flying off its hinges, and Ray races into the room, enveloping you in a bear hug—nearly cracking your ribs—spinning you around in circles as he bellows with laughter and perhaps sheds a tear or two, touched, as he is, by this reunion. He’s a one-man Imagination pantheon, an explosion of gods and goddesses, each one with a unique story to tell. You get him to sit down for a minute or two, have a sip of wine, but he’s soon up on his feet, dragging you to the window, pointing to the clouds, the moon, the stars...the whole wide universe. You watch in wonder and delight as Bradbury reaches out, wraps his arms around God, yanks him down to earth and kisses Him full on the mouth. When Ray’s done, when he’s given his last oratory, spun his last tale, he crushes you in another bear-hug then races out the door, leaving you utterly exhausted, inspired—and grateful to be alive. My own belief is that the universe exists as a miracle and that we have been born here to witness and celebrate. We wonder at our purpose for living. Our purpose is to perceive the fantastic. Why have a universe if there is no audience? We are here to see and touch, describe and move. Our job, then, is to occupy ourselves with paying back the gift. Read Bradbury. Listen to Bradbury. Unfold your soul and let his words wash over you. If you're a budding writer, he'll fill you with burning passion for your chosen field. If you're an old hand like me, he'll make you feel like a newborn, just beginning on the most miraculous path God ever created. And if you're not a writer, I suspect he'll touch and move you in surprising ways that will echo on through your heart—and through your life. I’ll add one final thought to those I’ve reposted above: The writers that matter most to us become our dearest friends and companions. I’ve traveled the universes with my friend Ray for the majority of my life. A gentle reminder to let you know that my Mighty Thor Annual goes on sale today. As I've mentioned before, it's a huge cosmic adventure featuring Thor, the Silver Surfer, Galactus, Scrier, The Other and Oblivion—with art by the amazing Richard Elson. The page below should give you a little taste of what to expect—and it looks even more spectacular in color. (And, no, I'm not telling you what's going on there. You'll have to read the story to find out.) Enjoy! Thor and company are ©copyright 2012 Marvel Entertainment.